Karen Horton, Independent Textile and Ethnographic Conservator. Karen Horton trained as an archaeological conservator at the Institute of Archaeology, University College London, and then chose to specialise in Textile Conservation, training at the Textile Conservation Centre in the United Kingdom. 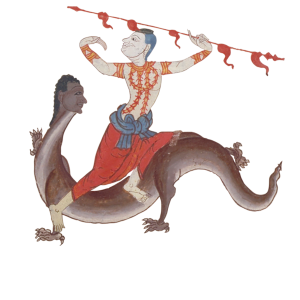 The Tibetan collection, which is mainly Buddhist, includes Tibetan sacred texts, ritual objects and forty-eight predominantly nineteenth century thangka’s of which 26 retain their textile mounts. 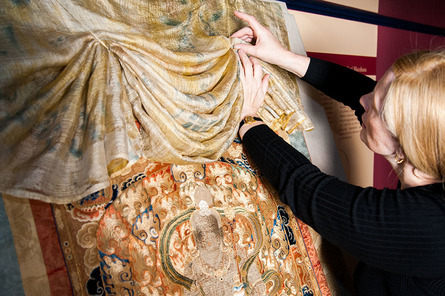 Karen’s talk will focus on the conservation of the Tibetan thangka’s textile mounts and the minimal intervention policy that the Chester Beatty Library adheres too. She will discuss the methods and materials used and the ethical implication of conserving sacred textiles as well as the non-invasive mounting method she designed and developed with her colleagues at the library to install the thangkas allowing them to be displayed with their veils pleated as they would have hung in their Himalayan temple setting.